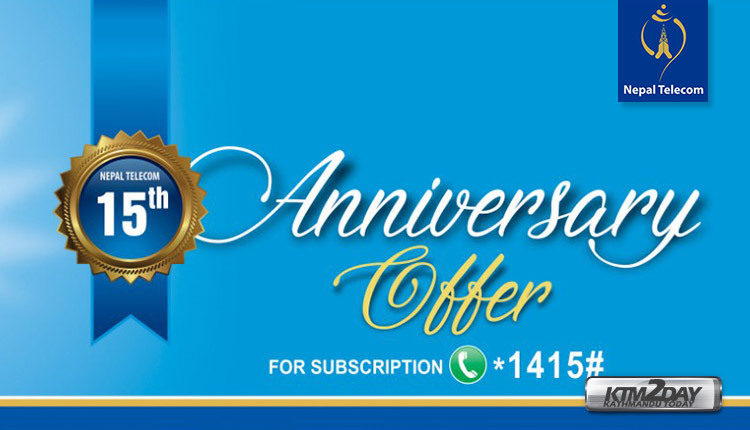 On the occasion of it’s 15th Anniversary Nepal Telecom has launched various offers in its mobile services – postpaid and prepaid, fiber internet service and roaming service. Nepal Telecom has started outbound roaming service now for prepaid mobile phone users who are entitled to use the new service without making any deposits. Similarly, the company is to provide 2 GB data per month in a 900 package for GSM postpaid customers. The scheme shall come into effect from today. Additionally, new customers of GSM postpaid mobile phones to be registered from February 6 to February 20 will be given free 1 GB ‘all time’ data and 100-minute phone calls per month till three months. Under the tourist package, 5 GB data, 50 minutes’ phone calls within the NT network, 50 SMS and a 100-minute international call services are available at Rs 500. The ceiling of these services is double in the package of Rs 1,000. The schemes were announced on the occasion of the 15th anniversary of the NT. Free Resource (Int’l call & off Net call/SMS) Rs.